Over the past few years the family and I have faced some major autoimmune health challenges…..more depth another time. During this time, however, we have swung from expecting the specialists and GP’s to give us the magic cure, to nurturing ourselves more and relying on the pharmacy less. We’ve never been unhealthy eaters, and I’ve always done my level best to cook from scratch, but with the aid of all the usual culprits from the supermarket. For the last couple of years we have been listening to our bodies more, and adjusting the food we consume accordingly. I’ve researched the heck out of nutrition (giving the Heart Foundation guidelines the wide berth they deserve; again, there’s another blog post in that!) and studied gut health, along with sourcing fantastic resources from this marvellous thing we call the internet….including some wonderful bloggers. Cue Rohan Anderson and Kate Berry. A very cute couple and dynamic duo who live their passions and walk the talk. 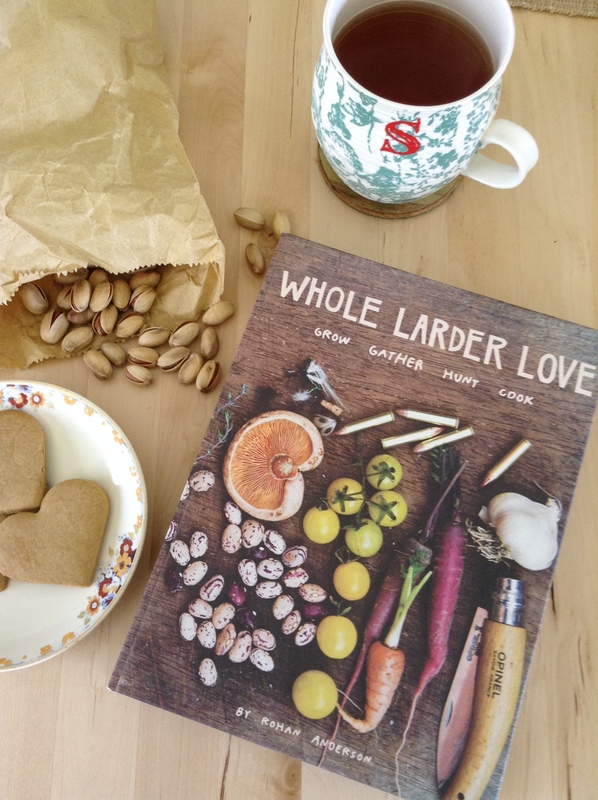 Over the past couple of years I’ve read on with admiration as Rohan grew his blog, Whole Larder Love, as well as his garden, the lifeblood that sustains him and his little family (without the help of any giant supermarket or unethical, processed product). Rohan’s blog became a book…..same name as blog……and he’s been travelling the world imparting his knowledge and wisdom, conducting workshops in his local area (beautiful Daylesford in country Victoria), tirelessly transporting veggie boxes to share with Melburnians….the list goes on!! Rohan Anderson’s book shares his food philosophy and beautiful recipes. A feast for the eyes and material for the grey matter to ponder. Meanwhile, Kate (who’s also a kickass photographer) has been Rohan’s biggest supporter and in her own right has established a gorgeous blog, Lunchlady. In its infancy it was a platform to share wholesome, simple recipes to make their way into children’s lunchboxes, instead of the revolting crap that unfortunately the majority seem to exist on. (I know, I’ve been a teacher, and now I observe with dismay the stuff (it can’t be called food) my children’s friends take to school each day. Gah, there’s another blog post!! Get off your soapbox, Sarah!! Anyhoo, Kate’s blog is now evolving into a bigger and if possible, better platform, with a host of cool people sharing all manner of nice and informative stuff about, well, family life, really, and how to make it a nice one! Now that I’ve given you the lowdown, I want to let you know about this couple’s latest initiative….they really never stop! The Nursery Project is a labour of love. They are in the midst of sourcing a parcel of land upon which to build a facility for like-minded individuals to come together, share and learn. They are focussed on creating “a place where people can get their hands dirty, breathe in some fresh air, talk, sit around a campfire and leave with a new lust for life”. They will demonstrate “all the skills for growing, raising, curing, preserving, hunting, foraging and cooking real food”. Wow. Wouldn’t we all be the better for spaces like this. It’s heartening to see communities embracing Farmer’s Markets and becoming more aware of the food they put in their mouths. Spaces such as this are a natural progression aimed at getting people to connect; with each other, with their own selves and nurturing their bodies, and, most importantly, their natural world, which is too often left behind as we go about our daily lives in ever spiralling little circles. All of this can’t happen without help, and naturally it’s of the financial nature to get this beautiful idea off the ground. These guys, who as I said earlier, truly walk the talk, need founding partners to help them out! They’re not millionaires, nor are they going to be as this is a real labour of love. We’re not millionaires in this household either, but we’ve given what we can….and if enough people contribute, well, little money can grow, can’t it??! The other way we can assist is by spreading the word, and that’s why I’m here telling you all about it……because great ideas deserve to be shared. It’s people like these who we need more of in this world. Just a handful of them balance up all the cruddy things that go on out there. Actually, I’m an optimist….they actually outweigh all the cruddy stuff and make our world beautiful. Go on, click on the links……..you’ll leave feeling better! *especially if you’re Jamie Oliver….they’d love your help!